Recovery Heart Rate is the heart rate measured at a fixed period after you have finished exercising. In order to measure your Recovery Heart Rate, you would need to work out for at least 8 to 10 minutes – long enough to raise your pulse to near maximal exhaustion. Typically, you would expect to see your heart rate rise from around 60/70 to 180/190 during exercise. To be able to compare results over time to assess fitness, you should ideally keep as many of the variables similar as possible – ie. the time of day that you are exercising, along with the period and intensity of exercise. You can test your Recovery Heart Rate anywhere! Using a stopwatch and either your finger to feel your pulse, or an app or heart rate monitor, take your pulse immediately after exercise and note this down. Wait a minute, then take your pulse again. The higher the number for the recovery rate, the more quickly your heart has recovered from exercise. Measuring your Recovery Heart Rate can be a good indicator of your level of your fitness. The fitter you get, the more effective your heart becomes, and so the less work it has to do to keep your blood pumping around your body, and keep you moving. But on the other end of the scale, the less healthy and fit you are, the longer it takes your heart to recover. This is what is referred to as Cardiovascular Fitness. Recovery Heart Rate can also indicate the intensity of the exercise you are taking. The smaller the drop in one minute could indicate you are working yourself too hard, and your body is having trouble recuperating. There are two decreasing phases related to Heart Rate Recovery; the first minute post-exercise, and the resting plateau over which the heart rate gradually decreases. The resting plateau can take as long as an hour for the heart rate to return to pre-exercise heart rate. As a general indicator, five minutes after exercise the heart rate should not exceed 120 beats per minute. After 10 minutes, the heart rate should be below 100 beats per minute, and the heart rate should return to its pre-exercise rate approximately 30 minutes after the exercise session. Although the initial sharp drop in the heart rate that occurs one minute after the exercise is the most meaningful indicator of fitness. Miguel Indurain – Spanish, five time Tour de France winner – had a resting heart rate of 28 beats per minute – one of the lowest ever recorded in a human. Just because we got ourselves cups at the weekend, it doesn’t mean training ends there – that’s just the start! Henley is getting closer on the horizon! This means the focus is now on maintaining and pushing the fitness, and developing the racing start technique. Today, I’m working on the fitness! As usual, I’ve been out strapped up with my phone and Bluetooth Heart Rate Monitor, and logged the route on my SportsTracker profile. 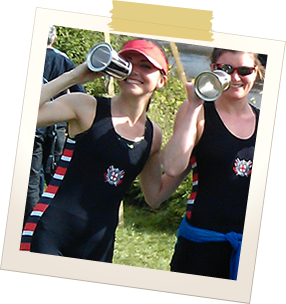 Despite the racing Saturday (+ the 16km row to and from the Regatta!) – part way along my legs definitely felt shot! – I was rather pleased with my performance. My first 2.5km was in 9 minutes 39 seconds, and I managed to keep an average between 13 and 14km/h – this was what I had been working up to on the treadmill, but never tried it out on the road! I have to admit though – I did have a couple of quick pit-stops en-route. I got from my house up to the big Sainsburys in Wandsworth (about 2.75km) and felt my legs were dying – I wondered what was wrong with me! It was at this point that I realised the pace I had been running at, and soon worked out why I was starting to hurt! As you can see from the heart rate – the brief blips are where I stopped to catch my breath and stretch out my legs before running on. In terms of recovery, I finished running at 28 minutes, then quick walked home at an average pace of 6-6.5km for the last 4 minutes before stopping altogether, and my heart rate dropped as follows. Using the heart rate recovery calculation (see Terminology), this would put me at (193-145) / 10 = 4.8 – I’m rather pleased with that for now, especially as this is not a true reflection of recovery rate given that I was still moving! It just goes to show what a bit of sunshine, and some good tunes can do to push you, no matter how tired you feel before you head out! I’m looking forward to plenty more runs out in the summer sun over the next few months. Although most of my friends would think I’m mental, going for a run early on a Sunday/Bank Holiday Monday can be great for the soul. Barely anyone around, the roads are quiet and the air is fresh and cool, it is a real pleasure to live in South West London!